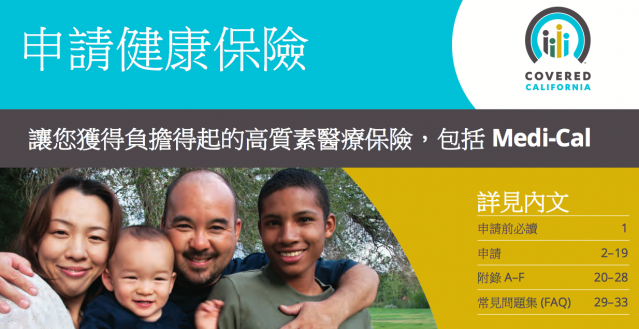 Covered California application in Chinese. While Latino enrollment has lagged in Covered California enrollments, Asians have signed up on the state's marketplace in numbers far outstripping their representation in the insurance pool. Our analysis of Covered California data shows a main driver: insurance brokers. According to new Covered California data, the overwhelming majority of Chinese, Korean and Vietnamese enrollments are coming through certified insurance agents as opposed to community groups or the Covered California website. Since January, Asians have been enrolling in strong numbers. People of Asian descent make up about 14 percent of the Covered California pool, according to estimates compiled by the UCLA Center for Health Policy Research and the UC Berkeley Labor Center. Starting with the first release of demographic data in January, Asians were already on target, reaching 13.5 percent of all enrollees. In the most recent data from Covered California, (for Oct. 1 to Feb. 28 enrollment), Asians advanced to 22.9 percent of all enrollees. These numbers "suggest that the Asian agents are a driving force in helping Covered CA exceed our enrollment goal in Asian communities," Wendy McAnelly, a public information officer for Covered California, said in an email. This information was not a big surprise to Simon Chew. He runs Ehealth-Plans, an insurance business with four offices in San Francisco. All his agents are trilingual -- in English, Mandarin and Cantonese. Chew estimates he's signed up 2,000 people since the Covered California marketplace opened last October, and half of them had been uninsured. He sees a difference between how Caucasians shop and how his Chinese clients shop. While what he calls the "mainstream market" is comfortable shopping online, the Chinese want to do business face-to-face, with someone of a similar background. "That's how, culturally, Asians do business," Chew said. "They like to stick to their own kind because of communication convenience." Chew also complained that too much Covered California advertising is focused on the website, as opposed to letting people know that their local insurance agents could also help them. Covered California did not have enrollment information breakdown by type for Latinos. They make up nearly half of the marketplace's pool, but only 22 percent of all enrollments. Covered California has been faulted for its missteps in signing up Latinos. Unlike Asians, Latinos are generally not familiar with health insurance as a product, so this can make sign-ups more difficult. There is no charge to consumers who work with agents, whose commissions are paid by insurance companies. But Asians are not a monolithic group, advocates caution. Doreena Wong is with Advancing Justice in Los Angeles. Her group oversees the single statewide collaborative of community groups that handles outreach to Asians to encourage enrollment on Covered California. She was surprised by the success that brokers have had over community groups in sign-ups. "I am surprised that is as high as it is," Wong said. "I don't know if that means that most of the enrollees in these communities are English-speaking." Community groups have long worried that those with limited-English skills would be left out of Covered California. Wong is concerned that certain immigrant groups who have less experience with insurance or universal health care in their home countries would be harder to reach. "The united Cambodian community, Indian, Pakistani," she said, "we don't know what the numbers are for those particular sub-groups." Yeri Shon, of the Korean Community Center of the East Bay in Oakland, said her group has had great success in signing up the monolingual clients she serves. There's universal health care in Korea, she says, so people are already comfortable with the concept of the government helping out. But she said in regular conference calls with other community groups held to share best practices, she's heard from other advocates who say they are having a harder time. "The Tongan community leader says teaching the idea of insurance is very difficult," Shon said. "In Tonga, people apparently only go to the hospital when they are really sick." While President Obama has insisted that undocumented relatives of people who sign up for insurance will not be deported, many advocates think this is still a barrier, especially for Latinos. Yet there are almost certainly undocumented Asian immigrants as well, and there does not seem to be the same level of fear. Wong believes that there may be a higher percentage of mixed-status Latino families than Asian families. "That fear may not be as pervasive (with undocumented Asian immigrants) because the face of immigration is Latino, even though there are high numbers of Asian immigrants." According to the modeling from UCLA and UC Berkeley, there are an estimated 370,000 Asians in the Covered California pool of potential enrollees. While their enrollment is strong, as of Feb. 28, slightly more than 160,000 had enrolled. Some advocates wonder if the better-educated people have enrolled, if covered California has reached, as Doreena Wong puts it, the "low-lying fruit." "As we continue on, it might be more and more challenging and take more effort to reach those who have been discouraged from enrolling or who have had bad experiences," Wong said.